Art Nouveau cufflink, circa 1900. Several months ago I wrote about the artistry of antique cufflinks. The beauty and design of antique cufflinks are undeniably captivating. History, along with adornment, are also factors that draw one to these miniature jewels from the past. These three factors - Art, History and Adornment - largely explain the pleasant surprise (the"AHA effect") experienced by many when first viewing antique cufflinks. Today I will briefly discuss the historic appeal of antique cufflinks. Antique cufflinks are windows into the past. They are miniature links to the past that reflect not just earlier fashions and tastes, but the enthusiasms and aspirations of the people who wore them. Consider the exotic mysticism of the Art Nouveau cufflinks pictured above. 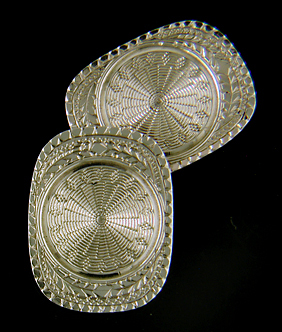 Or, the jazzy elegance of the brightly engraved cufflinks from the 1920s shown below. Each wonderfully captures the the spirit, the zeitgeist of its era. Jazzy Ziething white gold cufflinks, circa 1920. In addition to reflecting the spirit of an age, antique cufflinks often celebrated significant personal and public events in the life of the wearer. Appropriately known as "commemoratives," these cufflinks recorded events in the nation's history, important graduations and reunions, and corporate milestones. Often the commemorated event is easily recognized. Sometimes it remains shrouded in mystery. Pictured above is a silver-gilt cufflink featuring an impish fellow crowned with a laurel wreath. A scroll marked "degree" or "decree" is supported by his left hand. In his right hand he holds a long staff and his shirt is emblazoned with "99". The left border of the cufflinks is annotated "QUINDECENNIAL" signifying the 15th anniversary of an important event. What the important event was I have not been able to determine. Any thoughts? Closely related to commemorative cufflinks are links that signified the wearer's membership in a fraternal or social organization. In the late 19th and early 20th century there was a blossoming in clubs, lodges, granges and civic organizations. America was a nation of joiners and membership in a fraternal or social organization was often announced with a pair of suitably adorned cufflinks. Judging from the numerous examples of elegant Masonic cufflinks that survive, it is reasonable to surmise that the Masons were fervid cufflink wearers. Pictured above is a wonderfully designed and engraved pair of Masonic cufflinks from the late 1800s. Although the beauty and design of antique cufflinks is what first catches the eye, I am equally intrigued with the people who made and wore the cufflinks. The backs of cufflinks often provide a wealth of helpful clues. Above is a cufflink beautifully engine-turned in a radial barley corn pattern. Crafted in 14kt white and yellow gold, the cufflink dates from the early decades of the last century. Reverse of Link & Angell cufflinks. Examining the reverse of the cufflink helps tell its story. The cufflinks were given in 1919 as a Christmas gift to "S.C.F." (the "F" is obscured by the cross bar). Although SCF remains anonymous to us, the personal inscription on the back of the cufflinks creates a tangible link to the past. No doubt, on a Christmas morning ninety years ago SCF delighted in the beauty of the cufflinks as much as we do today. A close examination of the cross bar reveals more clues to the cufflink's history. The cross bar is stamped "14K" for the purity of the gold. Beneath the gold mark is a maker's mark. Although the lower half of the mark is lost at the edge of the cross bar, it can be read as the maker's mark of the firm Link & Angell. The mark is an "L", "&" and "A" suitably connected by three links. Founded by William Link in 1871, the firm under several names created elegant cufflinks and beautiful jewels for six decades. The Art Nouveau cufflinks pictured at the beginning of this note are also an example of the firm's work. William Link died in 1911 and the firm continued under outside management for several decades. The firm appears to have discontinued operations during the Great Depression. A wonderful reference, if you wish to learn more about Link & Angell and other makers of American cufflinks is "The Glitter and the Gold: The Fashioning of American Jewelry" edited by Ulysses Grant Dietz. The book is a delight to read and an invaluable resource. Recently several clients asked if I could provide notices of new additions to the Antique Cufflink Gallery. This is a good idea. So, every few weeks I will post a summary of recent acquisitions. This first installment features a striking pair of Larter serpent cufflinks, Carrington cufflinks in the Art & Crafts style, and jazzy sapphire and diamond cufflinks from the 1920s. Victorian Serpents! The Victorians were fascinated with serpents, bugs and other crawling things. These cufflinks are a dramatic example of snake-inspired jewelry from the late Victorian period. Crafted in 14kt gold, circa 1900. Arts & Crafts! Beautifully crafted cufflinks in the Arts & Crafts style from Carrington & Co. The hand-hammered gold surfaces shimmer like sunlight sparkling on a gently rippling pool of water. Crafted in 14kt gold, circa 1900. Sapphires and Diamonds! Beautiful cufflinks with blue Sapphires and sparkling white Diamonds. Dramatically engraved with radiating centers and jazzy zig-zag borders. Crafted in 14kt gold, circa 1925.